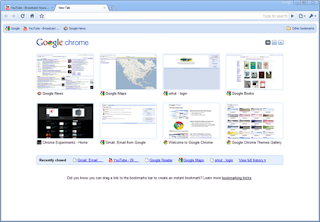 Google has announced the release of Chrome version 3 (stable release). Given that it just celebrated its first anniversary earlier this month, it may catch up to Internet Explorer versions in no time. The New Tab page (the blank page you come to when opening Chrome or opening a new tab) has been modified since the last beta release. You can rearrange the thumbnails and even pin thumbnails so they don't go away. The page also offers more customization options than before, such as displaying the pages as a list of links. What Google calls the Omnibox is the address bar that also acts as a search bar. Google has added icons to the drop-down menu to help distinguish between suggested sites, searches, bookmarks, and sites from your surfing history. Insofar as it is possible to support a spec that is still being written, Chrome added support for some of the core elements. In this release Chrome has added support for video and linked out to a sample site to test drive it. Google already had support for the audio and canvas elements and links to the 50th Chrome Experiment page to prove it. Chrome now supports themes. All those UI enhancements Google has worked so hard on can now be casually tossed aside by just grabbing an ugly theme. 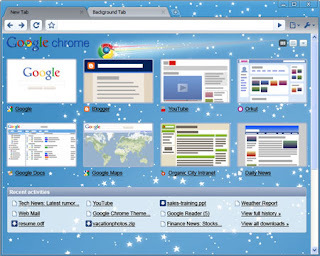 The example they show is the Stargazer theme. There are more in the Themes Gallery.